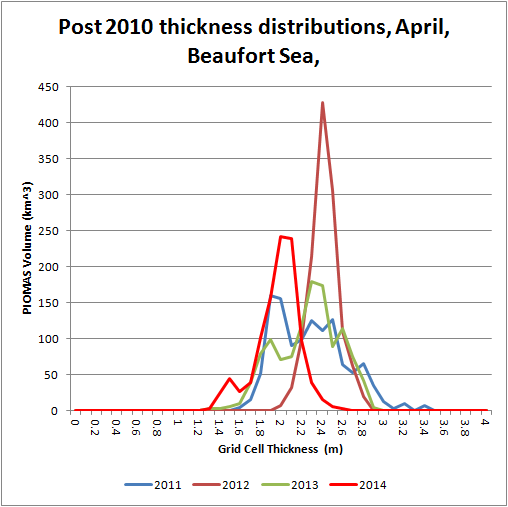 To start with here are some plots of the distribution of grid box effective thickness in April 2012 and April 2014. As will be seen from the following graphs, aside from the Central Arctic off the Arctic Ocean coasts of the Canadian Arctic Archipelago and Greenland, there really isn't much difference. However much of the pack towards Siberia seems to be at least 25cm thinner. Given model uncertainties I don't think it's helpful to get too hung up on such a small difference, so I'm sticking to the position that there is very little difference. Those who doubt the distribution of ice over 2m thick (which is typically multi year ice) should refer to ASCAT, e.g. the most recent image at day 132 here. The overall pattern is very similar. As usual I'm going to present thickness distribution plots for, All PIOMAS domain, the Beaufort Sea, The East Siberian Sea, and the Central Arctic regions (as per Cryosophere Today regions). On the subject of Cryosphere Today, they have a new page of weather analysis, here, bought to us by Global Weather Logistics. Hopefully this is a long term resource, I've been looking at it for a few weeks and may be relying on it throughout the coming melt season. However NCEP/NCAR will remain the mainstay for post-hoc analysis. 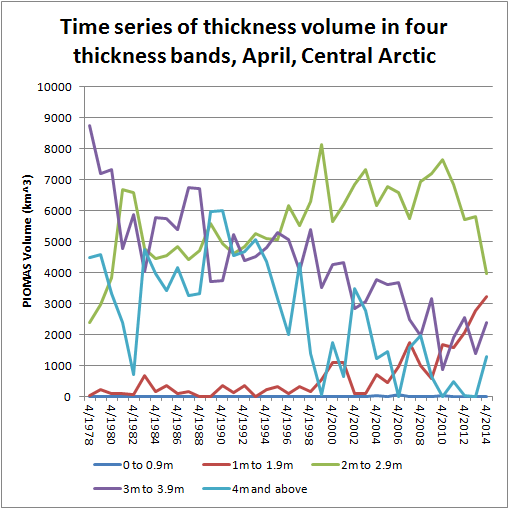 The following is a graphic of timeseries of volume broken down into regions, note that the right axis for the Central Arctic is at four times the scale of the left axis. 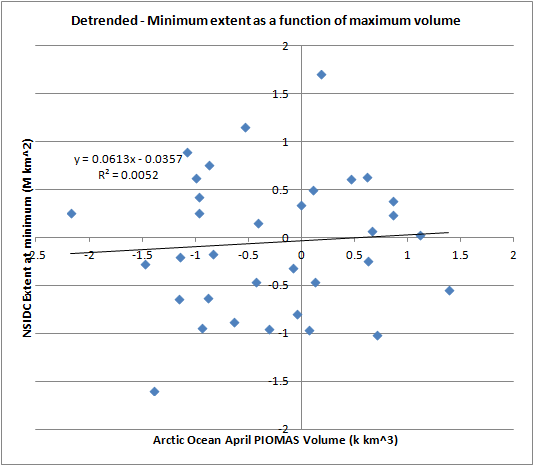 The only region that retains a significant volume increase is the Central Arctic. With a small uptick in volume for the '4m and above' ice category, the '1m to 1.9' and '2m to 2.9m' show the continuation of behaviour since 2007, there is a decline in the 2 to 1.9m category with an increase in the 1 to 1.9m category as ice volume moves into thinner ice categories with continuing pack thinning. Despite the muted melt of 2013 and claims of a recovery of sea ice* this process has continued as of April 2014 as if 2013 had never happened, as can be seen above the fingerprint of 2013 is visible in thicker ice in the central Arctic. *Link to David Rose at the Daily Mail, nofollow has been added! 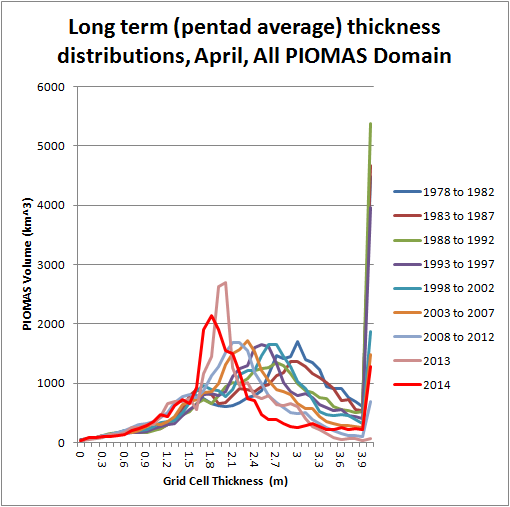 In terms of the long term plot in pentads (5 year averages) 2014 is seen to be biassed towards the thin end of the distribution. Again this puts talk of recovery in context. 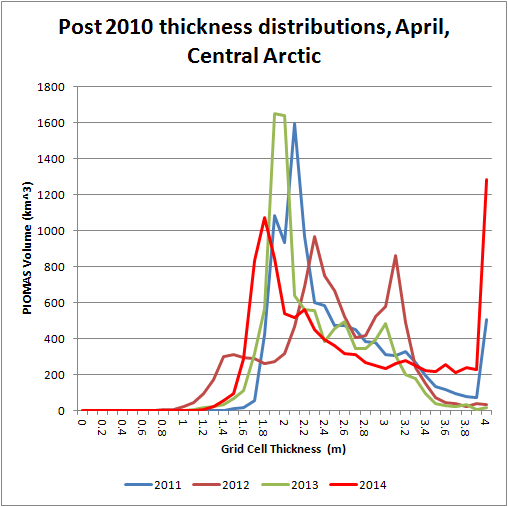 The development of thicker ice can be seen in the 2014 trace of the plot below (right of graph), however as indicated by the map plots, the peak of ice thickness remains fairly mono-modal and in the same region of thickness as in recent years. By mono-modal I mean clustered closely around the same thickness, typical of first year ice (FYI). I recently posted about a multi-year ice export into Beaufort from the Central Arctic and suggested that as in 2010 this might have a buffering impact reducing melt in Beaufort and Chukchi. Having followed it further on ASCAT I now suspect it is thin and dispersed and will probably have little impact on the coming melt season. The export of 2010 was of much thicker older ice, this years export may have an effect, but I think it will be minimal. PIOMAS doesn't explicitly model categories of FYI and MYI, so there is no way of telling the two apart without using thickness as a proxy, and that won't work for dispersed MYI. Certainly there is no evidence of thicker ice this year in Beaufort, indeed with 2m to 2.9m at a low, volume having moved down into 1m to 1.9m thickness grid cells, Beaufort looks rather thin compared to the past. In terms of pentads this impression is confirmed. 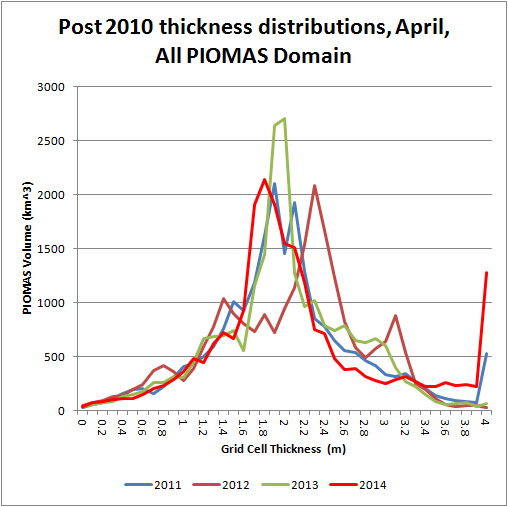 In terms of other post 2010 years 2014 looks fairly mono-modal, the modal thickness being around 50cm below 2012, a year of record breaking loss. 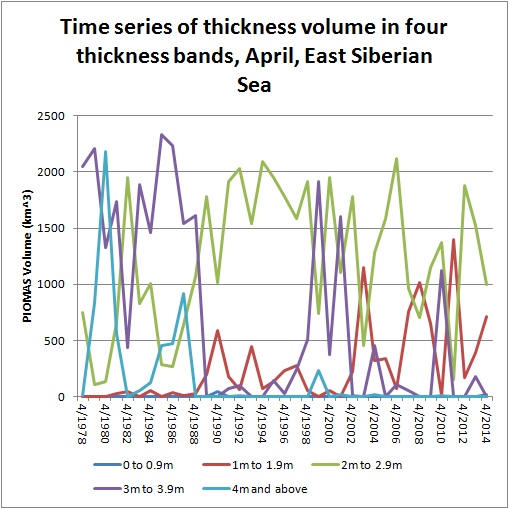 In line with the Beaufort Sea the East Siberian Sea (ESS) shows a movement from 2 to 2.9m thick down to the 1 to 1.9m thick band, resulting in the thicker ice declining and the thinner increasing. Long term this picture is confirmed using pentads. For post 2010 years the ESS is mid range. However, apart from 2013, in all of these years virtually all of the ESS has been open water by the end of the melt season in September. 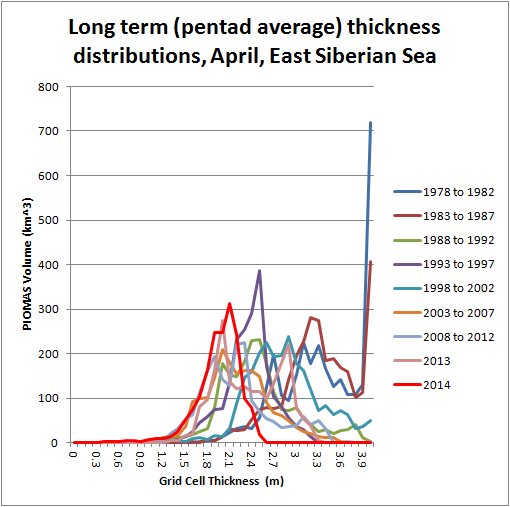 So none of this distribution gives reason to suspect significant sea ice survival in the Siberian coastal seas. As stated previously I have chosen the ESS as being typical of those seas most of the time. Once again the Central region shows a decline in the volume of ice 2m to 2.9m thick and an increase in ice volume 1m to 1.9m thick. However here there is an increase in the thickest ice (4m and thicker) of around 1000km^3, as the map plots that opened this post showed, the thicker ice in 2014 is well away from the area threatened by summer melt. 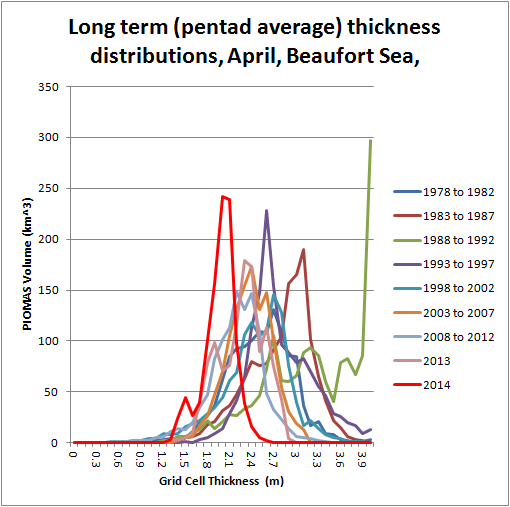 In terms of the long term picture provided by pentads, aside from the reappearance of ice over 4m thick and an increase of volume over 3.3m thick (compared with April 2013), there is no evidence of the increase of volume in 2013. Looking at post 2010 years in the Central region it's hard to see why ice thickness would be a factor in reducing the ingress of the ice edge in this region by the end of the melt season. Weather allowing there is no reason to expect that the peripheral seas around the Central Arctic will fail to melt out this year, so the battle for the minimum will probably be set by the dispersion of ice in the Central Arctic and inroads into the pack in that region. 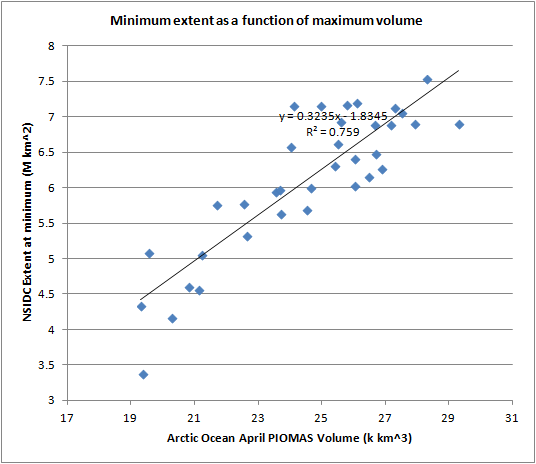 In my previous post I posted two graphs, shown here: The first shows the relationship between PIOMAS volume in April and NSIDC Extent in September. This shows a strong relationship between volume at the start of the melt season and the subsequent extent minimum, in other words volume (or thickness) has a strong role in the decline of extent. However when one detrends the relationship disappears. 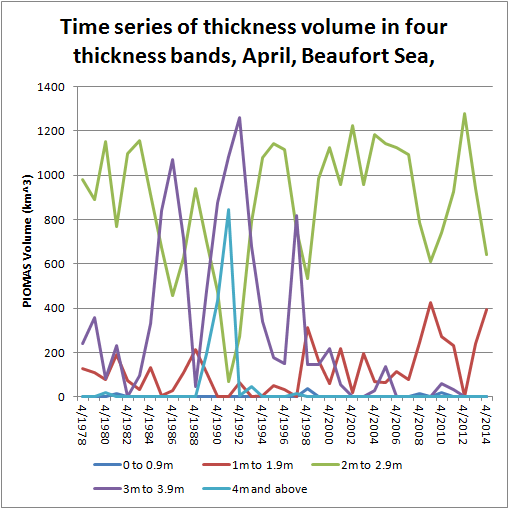 I don't think there is a strong relationship between April volume (or thickness) and what happens in a given season, volume (or thickness) seem to set the trend and have a smaller effect on annual variation. 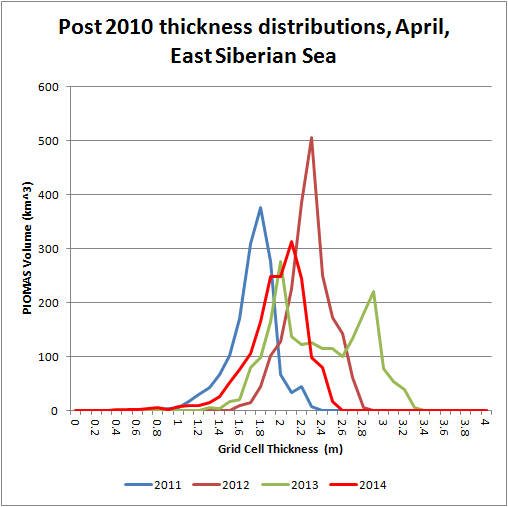 However, that the volume increase of 2013 is now restricted to the innermost Central Arctic region shows that we can expect 2014's September minimum to be on trend - volume/thickness conditions are now similar to recent years such as 2011 and 2012. As for 2013, I don't expect a repeat of those weather conditions because I see them as a one off 'black swan' event. So what happens in 2014 will probably be in the ball park of other recent years (apart from 2013), with weather being the decider as to what level of minimum we get come September. The next big milestone is the Cryosphere Area June Cliff. I agree with Neven that they play a big role in shaping the following melt season by preconditioning ice for melt. And I see the CT Area June Cliff as indicative of the spread of melt ponds at the start of the melt season proper within the Arctic Ocean. 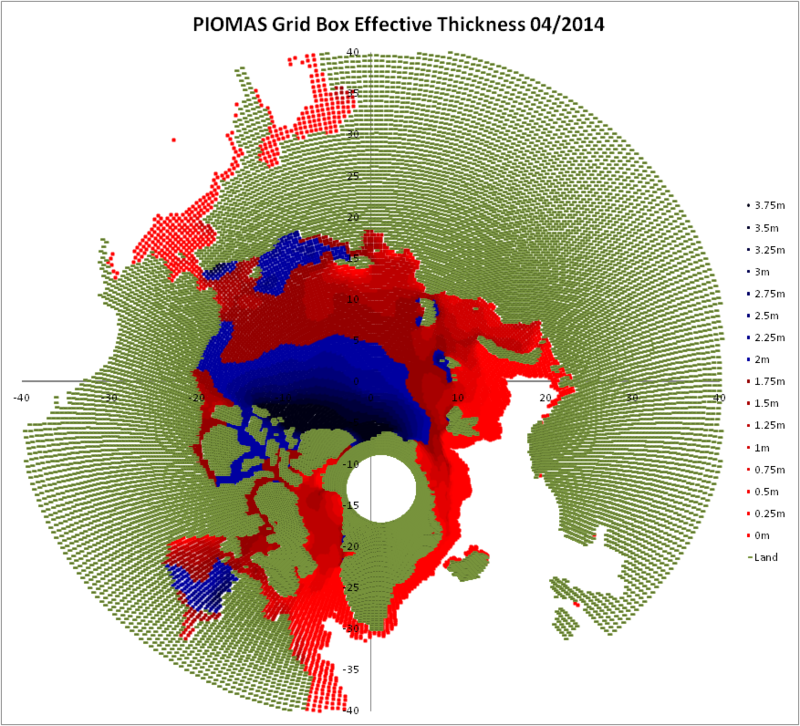 To close, I presented a plot last year showing ice volumes below and above 2m thick. 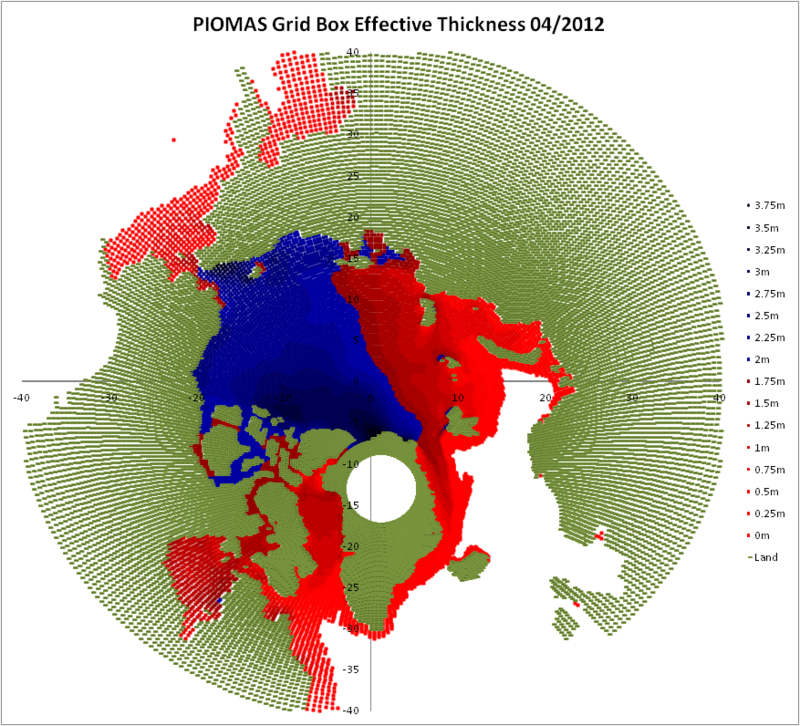 Using PIOMAS 2.1 data I've amended the demarcation to above and below 2.2m thick to take in more first year ice. The following plot is for the entire PIOMAS domain continued to this April. 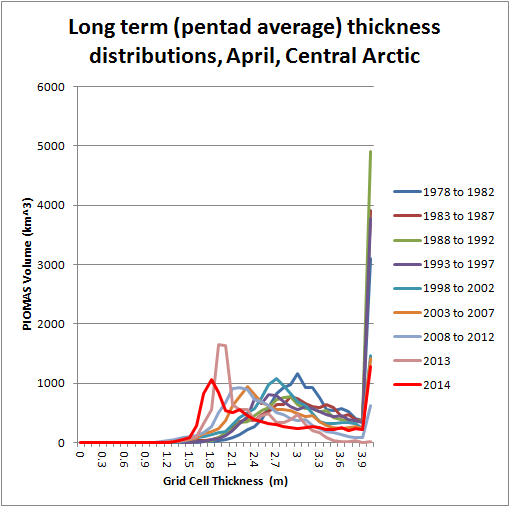 April 2014 is still on the nosedive trajectory of loss of thicker ice. That was not something I had considered possible last autumn. Great analysis, Chris. 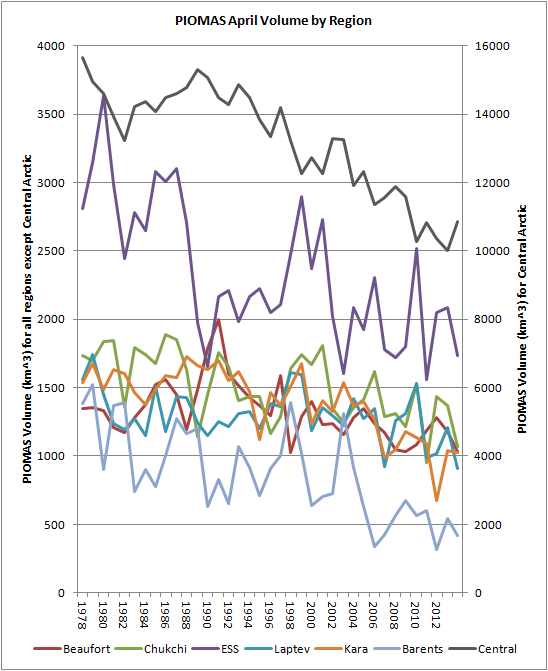 Looking at CAB in particular, the inference I draw is that 2014 (relative to other years) will have proportionately greater peak-to-trough decline in area/extent than in volume. That's opposite what I would have guessed from looking at other ice thickness maps, which imply some "protective arm" effect from the thicker ice in the Beaufort. As stated above, I'm now doubtful that the export of MYI into Beaufort will have that protective effect, as seemed to happen in 2010. That the Central region could have a large pk-pk loss volume range this year seems reasonable. Chris, I think the overall upshot of what we've learned in the past 12 months is that weather can slightly delay the inevitable, but it would take a streak of remarkably good (for sea ice) years to postpone it any significant time. Once again we can only conclude that the positive feedbacks are greater than the negative ones, that models have a conservative bias when it comes to sea ice, and that it will all (or mostly all) be gone in short shrift. BTW, I thought your critique of OSM's averaging method was spot on. There are too many things going on in the months leading up to the September minimum to simply expect averaging them to lead to any meaningful conclusions. Have you watched SIPN day 1 morning 1 from 57min onwards? 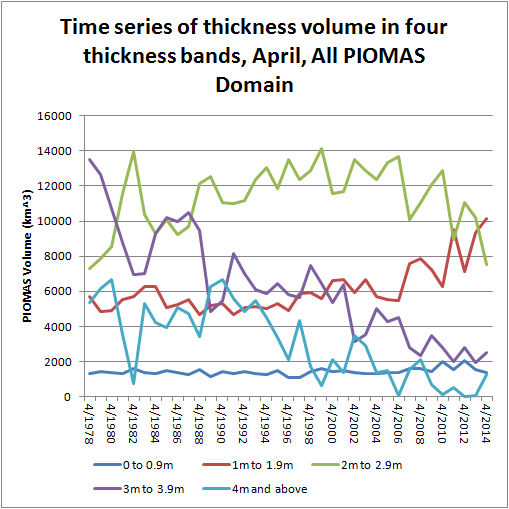 PIOMAS volume difference recovers after July which the other two models didn't. Is this some peculiarity of PIOMAS that may not exist in other models? what of reality? Is this possibly related to volume anomaly recovery you have seen? Yes that would be the late summer anomaly recovery. It would be exciting to know it wasn't happening in reality. I've made a note and will watch that video at the weekend, thanks. >"I've amended the demarcation to above and below 2.2m thick"
I think I would suggest that the thickest ice that can be melted is more typically ~1.85m in recent years. Of course there will be some ice up to or over 2.2m thick that gets melted because of a favourable location and/or transport of ice out of the cell. This year seems to show more volume of thickness that can be melted. So I think I would like to see some other splits. Maybe 1.85m and increasing 1cm a year to 1.85m for this year. How would those numbers correlate with volume at Sept? Maybe area numbers might correlate better? In that final graphic I'm more interested in the ice that can be considered first year ice. With regards the SIPN material. I think what we're seeing there is what we already know about PIOMAS. The spring volume loss is very aggressive in the experiment (removal of 1m thickness) so the ice retreats very very quickly (in one month!!!) to the CAA and northern Greenland. We seem to be seeing something similar in my anomaly calculations where the 1980 to 1999 baseline vs recent years is similar to the control/experiment presented by Dr Blanchard Wigglesworth. Thanks for sharing that, very useful.